Our Community Room offers a cool, quiet spot for gathering colleagues, participants and others for project meetings, workshops, rehearsals, and more. View details. Looking for a fun, unique outdoor wedding venue? 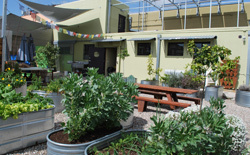 The garden offers a uniquely hip, outdoor environment with lush greenery, outdoor lighting & some furniture, easy access to restrooms and more. The Garden is available for wedding events Thursday-Sunday from 9am to midnight and can accommodate up to 100 guests. No catering/beverage/equipment is offered. Please refer to the form on the Community Room details page to contact us if interested.